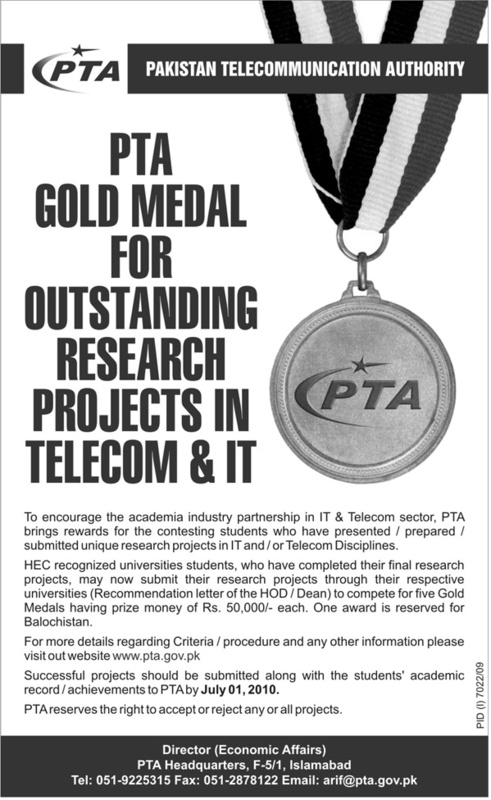 To encourage IT and Telecom students of Pakistan, Pakistan Telecommunication Authority has announced awards for those Students who have presented, prepared and submitted unique research project in Telecom and IT of extra ordinary level will be awarded with medals and cash prize. Students of HEC recognized universities, who have completed their final research project in this summer, can submit their research project through their respective universities (Recommendation letter from Dean/HOD is mandatory) to compete for Gold Medal and cash prize of 50,000. One award is specifically reserved for Baluchistan.